Are you a Professional? Are you Single? Are you in the DMV? Check this out! If there’s anything the Beltway is not short of, it is the amount of Single Professionals (some have even mastered the art of being Professional Singles). In 2009, Forbes rated Washington DC #5 on its list of Best Cities for Singles and if you just wait till 5:00pm in Metro Center (The subway transfer point for 3 major lines) you will see the hoards of “Professionals” equipped with Ipods, Blackberry’s and books to read while enduring the commute to and from the workplace. With Valentine’s Day rapidly approaching, Professional Singles are asked to put down the books and embrace an alternative that has been offered. 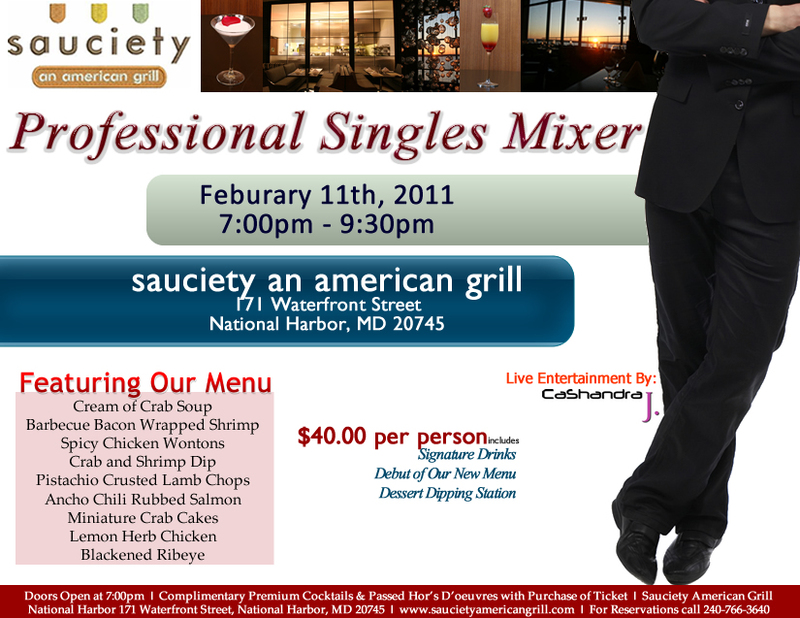 On Friday February 11th, Sauciety an American Grill is offering a Professional Singles Mixer. This is not like your every day networking events, that we all hate and dread going to! This event is targeting a specific group of people, and could possibly change the lives of a few singles in the future! For $40 patrons can enjoy; Signature Drinks, the Debut of their new menu, a Dessert Dipping Station, and to top this all off live music by CaShandra J. a performing artist who is singing all over Washington DC. But most of all…these Single Professionals will get an opportunity network, lay foundations with, and potentially meet other Single Professionals that might lead to future long lasting relationships. Doors open at 7pm and by using the promotional code AMyers you will receive an extra $5 off and if you purchase more than 5 tickets, the price drops by $9 dollars! For reservations call 240-766-3640. PUT DOWN THE BOOK and join us at this event!! !